Organizing time is so important and not just for work. I’ve spent the time since my last post really trying to organize how to manage my commitments, between a full-time job, chasing the game audio job and having (a little) social time. It’s difficult for sure, but I think I’ve figured it out, so going forward I’ll be posting weekly. I want to mostly be using this blog to update on what projects I’ve been working on, but I’ll most likely post other things too if I think they are relevant. Honestly one of my goals is to become a better writer and this blog I’m hoping will help me hone my skills for this. This for several reasons, one of them being that I want to write books, both on game audio (eventually), breaking into game audio (maybe other jobs too) and a piece of fiction that I’ve had in my head for years now. Writing is something that I’ve always struggled with, but seeing that through a lot of hard work I got a first for my undergraduate dissertation and my post-graduate thesis. It’s important as a communication tool, not just for raising a social profile, but for most importantly, communicating within a work environment. So that being said, what exactly have I been doing? Well, I’m still working on my adaptive foley project. I’ve spent some time building the level / environment from scratch and I’m just about happy with it to start doing the sound design. The level it’s self is very low poly and basic, but let me tell you, it gave me even more of a huge appreciation for the work environment artists and everyone else puts into these levels. The amount of attention to detail it takes to get something like Last Of Us level quality, I can’t even imagine. To anyone reading this who are involved in level design and related fields, my preverbal hat is forever off to you all. 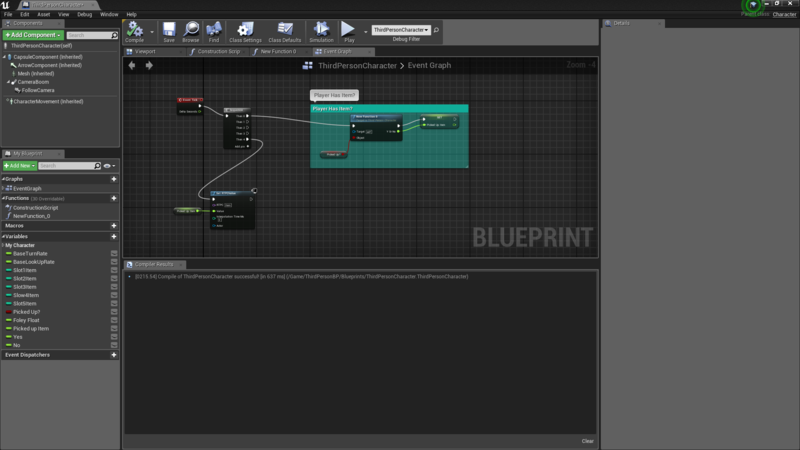 So, I’ve set everything up, including the blueprints that should make the system work. This week I’m going to spend creating various pickup and foley sounds for each of my chosen items that the player finds throughout the world. I’ll also be making the ambiances and then figuring out a way to manipulate some aspects based on distance. One of the things I want to implement is as the player gets further away from the sea, it becomes less audible. I may just end up using a giant attenuation cone, but I am wondering if I can manipulate that with an RTPC. Another project I have which will be an ongoing one is a Wwise only project where I am setting up various events / RTPC’s etc. to control theoretical gameplay. I say theoretically because I’m doing this based on real-life AAA projects. I came across a similar project online and inspired to do my own version. First I started with Anthem, like the project I found online. The reason I decided to also start with an Anthem Wwise project was that Anthem has such rich landscapes and environments to work with. To get my head around using events to start and stop other events, this would be perfect. Not to mention, it’s one of my most anticipated games right now and I feel there’s so much potential gameplay that could be shown in a ‘fake’ Wwise project. I did Expand this on this concept a little further; experimenting with an implementation idea for the Leviathan Axe seen in God Of War. I wanted to make an asset in which Wwise fully controlled the panning of the Axe as Kratos threw it. Going forward, whenever I find something that grabs my attention in a game, I’m going to see if I can recreate its effect using Wwise. I’m going to put together a couple of videos showcasing these projects soon and it will be going up ASAP. Until then friends! back to work, it is!